3 Piece Black Japanese Sword Set | BUDK.com - Knives & Swords At The Lowest Prices! 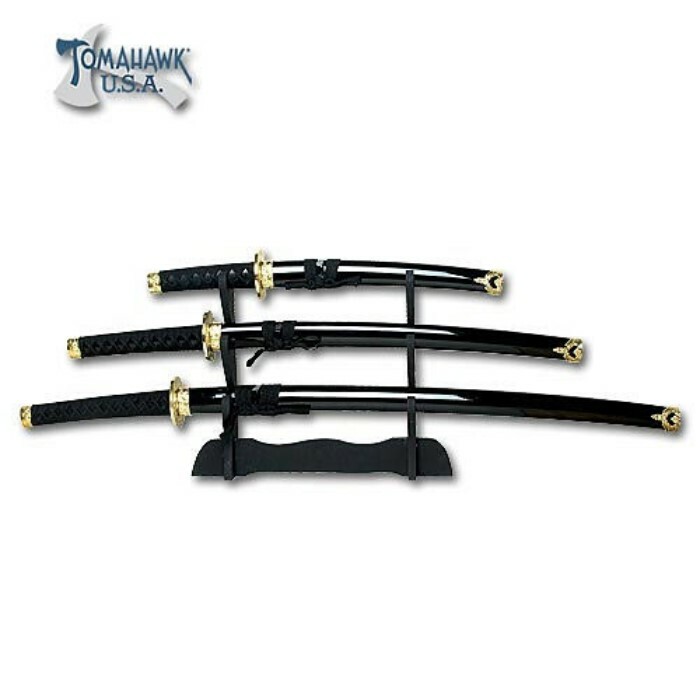 This elegant 3-piece Japanese sword set will please any serious collector or samurai enthusiast. Each piece is equipped with an authentic pattern carbon steel blade. The black nylon cord wrapped handles are accented with brass finished zinc aluminum tsuba and pommel, and the wood sheaths are adorned with coordinating cord wrapping and furnishings. The measurements for each item in the set are: Katana: 40" overall, 27" blade; Wakizashi: 31" overall, 19" blade; Tanto: 21" overall, 11 1/4" blade. This set includes a wood display stand. Tomahawk, XL1275.